Set pressure, inlet and outlet thread to your requirements. please contact our Sales or Engineering team. or Fixed Pressure and Accessories. speak directly with one of our engineers. For Oxygen use only - Must be utilized with one of our Oxygen filled disposable cylinders. 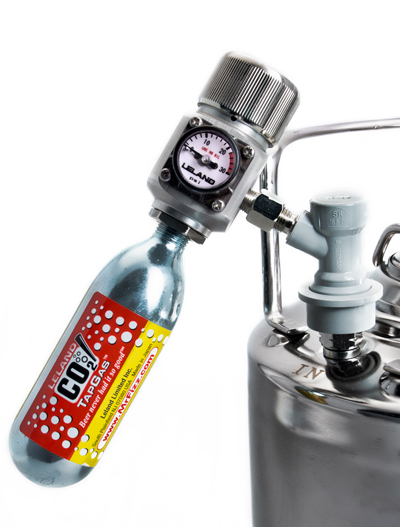 For Nitrous Oxide use only - Must be utilized with one of our Nitrous Oxide filled disposable cylinders. For Carbon Dioxide, Nitrogen, Argon, and Helium. Inquire for other gases tech@lelandltd.com. 50045 Regulator, NR-18 80 PSI Shown with Barb 50029-001 not included . 5/8-18 inlet, use P/N 50037 bushing to convert to 3/8-24 or special order 1/2-20. 1/8 NPT Outlet. Simple knob adjusts pressure up to 80 psi max. Primary safety rupture disc. Ni plated brass body, stock item. 50047-004 Regulator, NR-24 80 PSI 5/8-18 inlet, use P/N 50037 bushing to convert to 3/8-24 or special order 1/2-20. 1/8 NPT Outlet. Simple knob adjusts pressure up to 80 psi max. Gauge reading in PSI. Primary safety rupture disc. Ni plated brass body. Stock item, 90 day re-order. 17 PSI 5/8-18 inlet, use P/N 50037 bushing to convert to 3/8-24 or special order 1/2-20. 1/4" Hose Barb Outlet. Fixed pressure set to 17 psi nominal. Primary safety rupture disc. Ni plated brass body. Only 40 remain, in stock. 15 PSI 3/8-24 inlet, 3/16" Hose Barb Outlet. Fixed pressure set to 15 psi nominal. Primary safety rupture disc. Ni plated brass body. Only 37 remain, in stock. 1⁄4” hose barb outlet ISO-7 RP1/8” threaded with O ring. Use for replacement on 50034 & 50033 regulators, chrome over brass. 1⁄4” hose barb, special 1/8”NPT male thread with O ring, fits all NR series regulators with 1/8”NPT female outlets. Medical grade S/S. Threads shortened for clean flush mounting against regulator body. Hose Barb, 1/8” NPT Thread 1/8” barb, needs C1 O-Ring. 1⁄4” hose barb, 1/8”NPT male thread fits any regulator with 1/8”NPT female outlet. Medical grade S/S. Special Urethane 90 durometer seal for use with many of our regulators and piercing pin assembly. Please consult with engineering@lelandltd.com before attempting to use this seal as certain gases may not be used with Urethane. Cutting Pin/Piercing Pin assembly used to pierce through puncture type gas cylinders. Stainless Steel, Nickel plating over brass construction with 40 micron sintered screen filter in the back side of the piercing pin. We recommend the 50039 sealing disc to ensure a proper seal. When properly combined, no gas loss is experienced during the puncture. NR-24 , NR-30 and some NR-18 regulators are predrilled to accept this mounting bracket. Can be wall mounted, or allows one to hang assembly from keg or aquarium. Stainless Steel, drilled, supplied with 4 M3 screws. Luer female in stainless steel with a 1/8” NPT male threaded end. Perfect for Medical and Scientific experiments when connected to one of our regulators with the 1/8” NPT female. Luer male in stainless steel with a 1/8” NPT male threaded end. Perfect for Medical and Scientific experiments when connected to one of our regulators with the 1/8” NPT female. Any non threaded 8g CO2 or N20 cartridge can be punctured by placing it in the screw-on holder and turning down onto the hex puncture block. 1⁄2” NPT female outlet with an anti-blowback check valve is built in. Solid brass construction with a heat treated puncture pin makes this a classic tool used for clearing oil lines, A/C drains and many more applications. Black poly base perfectly fits our 1.5” cylinders and allows the cylinder to stand up straight. Perfect for table top and lab use. Use again and again.